Losing a parent is always difficult. You may find yourself struggling to make funeral arrangements, sell their home, or figure out what to do with all their possessions. But it can be even more difficult to deal with your parent's finances. This can be compounded if your parent or parents did not have a will or if they are in a lot of debt. While you are not responsible for paying off your parents' debt when they die, their debt may affect how much you inherit from them. Read on for our guide on how to deal with a parent's finances after they pass away. First, it's important to keep in mind that you are not responsible for your parent's or parents' debt after they die, as long as you did not cosign on the loan with them. Their debts will be paid via their estate, which means that the proceeds from selling their home, cars, or other possessions will be allocated toward the debt. Then the credit companies will write off the remaining debt. Second, if your parents did not have a will, you will have to go to probate court to have everything settled. This can take some time. During this process, you can contact your parents’ creditors and furnish the companies a copy of the death certificate. This should stop any collection calls and possible foreclosure on the home until the estate is settled and the debt is paid off. If your parents had life insurance and you are a designated beneficiary, you do not need to use that money to pay off their debts. It is your money or your inheritance, and it is not used to settle the estate. However, if there is no designated beneficiary on the life insurance policy, it becomes part of the estate and must be used to settle the debts before you will have access to any of the money. Ask your parents to name beneficiaries on their life insurance policies to avoid this. 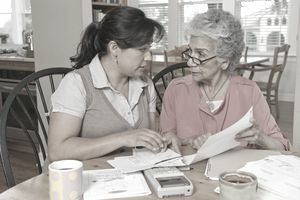 Although it can be a difficult conversation to have, it is important to talk to your parents about their financial situation and their estate planning. You can ask them to compile a list of bank accounts, investment accounts, life insurance poilcies, and any debts they have. Then, agree on a safe place to keep the list. This can make sorting through everything easier when the time comes or if you need to help your parents financially. You may also want to talk about funeral plans at this time. Some people purchase a life insurance policy that will cover burial expenses. Other people pay for their burial expense before they die. Ask what your parents have done so that you are prepared when the time comes. You may also want to talk to your parents about their plans for extended care and their wishes if they can no longer live alone. A few frank discussions can help everyone be prepared should this happen. The best time for your parents to purchase long-term care insurance is in their early 50s, so having the discussion now can make everything easier. When you are in your 20s, your parents may still be very active and working. You may not even think about many of these decisions because you expect them to continue to do well for several more years. However, sometimes the unexpected does happen, or your mother or father may receive a serious diagnosis. It can help to have these discussions before these situations come up. Also keep in mind that the situation may change as time goes on, or if your situation changes. For example, if you get married or if your parents' needs or health changes. You may also need to talk about caring for younger siblings, other responsibilities, and their expectations. It is still better to have an overall plan in place so when you do get to the point where you need to help care for your parents you are ready, whether it is now or in 20 years.